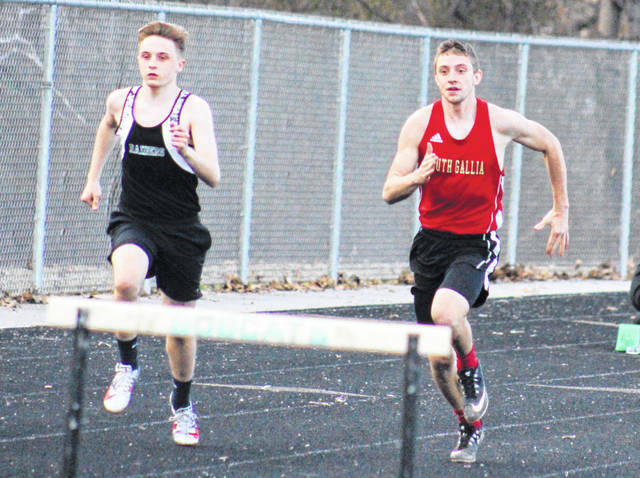 River Valley’s Noah Patterson and South Gallia’s Justin Butler compete in the 300m hurdles on April 2 in Bidwell, Ohio. MERCERVILLE, Ohio — The River Valley track and field won both the boys and girls team titles at the South Gallia Invitational on Saturday in Gallia County. The Lady Raiders’ team total of 150.5 was 51.5 ahead of Southern in second. Waterford took third with a score of 89.5, followed by Pike Eastern at 77, and Federal Hocking at 51. Wahama claimed sixth with 43, followed by Wellston at 32, Green at 30 and Trimble at 26. The host Lady Rebels rounded out the 10-team field with a score of 14. The RVHS girls finished first in six events, while placing second in four more. The RVHS girls won three relay events, with the 4x800m squad of Julia Nutter, Hannah Culpepper, Brooklin Clonch and Lauren Twyman posting a time of 11:40.37, the 4x400m team of Culpepper, Savannah Reese, Rakia Penick and Kate Nutter recording a time of 4:46.76, and the 4x100m quartet of Reese, Nutter, Hina Horimoto and Gabrielle Gibson setting a pace of 58.10. The Lady Raiders picked up second in the 4x200m relay, with the squad of Horimoto, Alexis Stout, Madison Burd and Jaden Bradley coming in with a time of 2:08.12. Leading the RVHS girls individually, Reese won the 400m dash with in a time of 1:05.37, and finished second in the 200m dash with time of 29.21. Twyman won the 100m dash with a time of 13.34, while Taylor Huck claimed first in the pole vault by clearing 7-6. Culpepper took second in the 1600m run with a time of 6:40.81 for RVHS, while Elisabeth Moffett was runner-up in the discus throw with a distance of 88-08. The Lady Tornadoes won two events, to go with five runner-up finishes. Sydney Roush won the 3200m run with a time of 13:05.22, while placing second in the 800m run at 2:44.52. Baylee Grueser earned the Lady Tornadoes’ other championship, covering a distance of 88-10 in the discus throw. Kayla Evans had a trio of second place finishes, leaping 13-7.75 in the long jump, while running the 100m hurdles and 300m hurdles in 17.95 and 53.96 seconds respectively. Baylee Wolfe earned second in the high jump for SHS, clearing 4-8. MacKenzie Barr was the Lady Falcons’ only top-2 finisher, placing runner-up in the pole vault at 7-00. The Lady Rebels’ top-finisher was Jessica Luther, who was third in the 3200m run with a time of 15:06.22. The RVHS boys’ winning score was 153, a full 64 points ahead of runner-up Trimble. Green was third at 76, followed by South Gallia with 59, Waterford with 54 and Southern with 49. Federal Hocking was seventh with a score of 41, a single point ahead of Wellston in eighth. Pike Eastern and Wahama rounded out the 10-team field with 35 and 14 respectively. The Raiders won five events, including a trio of relays, while placing second in a quartet of events. The RVHS 4x800m team of Rory Twyman, Brandon Call, Dylan Fulks and Caleb McKnight turned in a winning time of 9:05.47, the 4x400m team of McKnight, Call, Twyman and Trevor Simpson set a pace of 3:46.52, while the 4x100m team of Simpson, Cole Young, Jared Reese and Nathan Cadle was first around the track in a time of 47.46. Call claimed first in the 800m run with a time of 2:11.29 for RVHS, while Weber won the discus with a throw of 131-4. Darian Peck was second in both the discus throw and shot put, with respective distances of 116-4 and 40-1.5. Fulks was runner-up in the 1600m run with a time of 4:58.91, while Cadle claimed second in the pole vault at 12-00. The Rebels had three first place finishes and two second place finishes, all coming from the duo of Kyle Northup and Justin Butler. Northup won the long jump with a leap of 18-9.5, won the 400m dash in a time of 56.27, and was second in the high jump at 6-00. Meanwhile, Butler won the 110m hurdles with a time of 17.79, and took second in the 300m hurdles at 46.02. Southern had one champion and one runner up on the boys competition, with David Dunfee winning the shot put at 42-9.5, and Trey McNickle placing second in the long jump at 18-9.25. The lone White Falcon with a top-2 finish was Josh Frye, who took second in the 400m dash at 57.64. Visit www.baumspage.com for complete results of the 2019 South Gallia Invitational.